Once again it is Huntington Harbor Boat Parade Time. Presented by the Huntington Harbor Philharmonic. Starting at the center of the harbor at 5:15 pm each night the boat parade is fun for the whole family. With several beaches and bridges in Huntington Harbor to view the parade and of course at the Huntington Harbor Yacht Club, there is space to view the parade but get there early. The 2017 Theme is “Musical Kicks On Route 66”. This years Grand Marshal Eva Kilgore says “Our Theme …. Lends itself to oldies, and whatever sparks the imagination”. 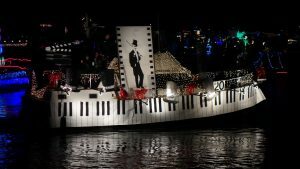 For over 50 years the residents of Huntington Harbor have decorated their homes for the Cruise of Lights and their boats for the boat parade in support of the Huntington Harbor Philharmonic. Don’t worry if you can’t make the boat parade, you can still enjoy the lights by getting on one of the many Cruise of Lights tours December 15-18 and December 21-23. Once again, Huntington Harbor has become the place to see the holiday lights. The Huntington Harbor Philharmonic is one of the 22 committees supporting the Philharmonic Society of Orange County, the counties oldest non-profit music organization that supports over a quarter million students in their quest for music. Additionally over 1,500 presentations are offered each year by professional musicians at no charge to all public and private schools in Orange County. Proceeds from the Huntington Harbor Boat Parade and Cruise of Lights support these programs. Illiam Workman and Kelly Bourquin both volunteered their time to photograph the event. Next Topic: Is Your Business Going Mobile? – Mobile Phone That Is.